Hi yes this is a Gazania - did you overwinter your? I was really surprised to find mine survived the winter - I thought they were more suited to warmer climates - I see you live in France is it warmer where you live? Hi thanks for that. Still getting to grips with whats what!! Yes ours overwintered which was a surprise. We may be in Southern France but we live on the Massif Central, so not only do we deal with Mediterranean weather in the summer but mountain weather in the winter which presents a challenge in the garden. Yes, looks like a Gazania all right. They have narrow, silvery backed leaves. I have some myself but the beautiful flowers only open out in the sunshine, which is a pain when you're out at work all day. Amazingly, mine are still struggling into flower even now, despite a couple of punishing frosts recently. Love Gazania's. They grow well here in Perth, they love the heat and very coastal tolerant. Wow! This will have to be a must on my shopping list this year, How Vibrant! 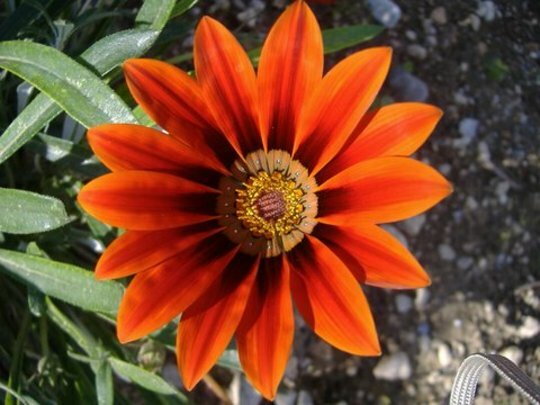 Hi Maple, this is a lovely photo of Gazania, I've sown one similar (Gazania Daybreak Bronze F1) ideal for hot spots & patio pots, this will be the first time i've tried them, seedlings are doing well, hope we get plenty sun this year.